Independent developers have turned into an astonishing force to be reckoned with. Nowadays, the breadth of talent across the world from smaller studios never goes unnoticed and that’s really how it should be. That’s why I jumped at the chance of getting on a train to London to take a sneak peek at the Modus Games Event to see what they have been cooking up in their kitchen. I also get to try out some unreleased stuff that some of the developers under the Publisher have been working hard on. Nestled in at the Loading Bar in Shepherd’s Bush, I got to get up close and personal not only with some great titles that will be coming to Nintendo Switch soon but also with some of the brains behind what was being shown on-screen. With no uncertainty, I can tell you that you’re going to want to save up some cash as there are some interesting and beautiful gems about to land on the eShop very soon that aren’t to be missed. It seems only fitting to start off with the star of the show and the most recognized franchise out of the bunch. Fans of the series will be glad to know that the folk at Frozenbyte have listened to feedback and have created another magical 2.5D platformer, ditching the fully 3D nature of the previous game in the process. Trine 4: The Nightmare Prince is absolutely stunning. I was shown a handful of different stages by the producer and each and every landscape was gorgeously animated with even more charm and charisma than before. One section had the players help out a chubby badger who lost his journal thanks to the evil forces running around his cramped and cluttered library. Delving deeper into his wooden house, tracking down the journal was a puzzle in itself with the need to effectively navigate through traps utilizing the playable characters’ abilities. Much like before, progress can be achieved in a multitude of ways and it’s best to do it cooperatively. Thankfully though, the option for up to four players to go at it online or locally will be readily available at launch. The traps and puzzles differ depending on how many players are on screen so the experience will be altered each playthrough, which is a nice touch. With a captivating story-line, dollops of humour, and a magical and familiar soundtrack, Trine 4: The Nightmare Prince is shaping up to be the most enchanting in the series to date. Some of the annoyances have been ironed out from the previous entries with Frozenbyte using a brand new and improved engine that’s pumping out stunning visuals and even better physics mechanics. Trine 4 will undoubtedly push its way up the platforming ladder and will hopefully be setting a very high bar for others to reach. Trine 4: The Nightmare Prince is currently slated for a Fall 2019 release date. If its adventure and exploration that you’re after then pay attention to Ary and the Secret of Seasons. Ary is going to be one of those games you’ll play on a Sunday after when you’re cosying up for a night full of gaming to get your mind off the impending Monday blues. You control a young girl named Aryelle – Ary for short – to journey across the great world of Valdi. You’re bestowed with a great gift, a gift of being able to control all four seasons. Navigating through a vibrant and colourful town – which I was told was one of the main hubs in the game – it was easy to see where developer eXiin and Fishing Cactus got their inspiration. Wind Waker vibes in full flow, we tackled a simple puzzle by firing an expanding globe of Winter at a body of water. Using the new nifty ice platform that I created, I was able to reach the other side and get a better view of the town. It was warm and calm; a beautiful sunset blooming over the top of the main street of shops and houses which intertwined round cobbled streets and fountains. Unfortunately, due to the demo build, I wasn’t permitted to take a couple of hours to soak it all in, but I was shown another puzzle. Ary can slingshot the seasons with the help of a firing line. This created interesting techniques to clear a complex puzzle that had me using Autumn to make parts of the room flood. I then attached a Winter orb to a swinging pendulum that created a frozen, moving platform for me to grab on to so I grab the key from a high ledge. Carefully using each element, it’s satisfying to have things click into place. Combat is light and playfully simple in Ary, it’s very far from being serious and brutal. We encountered a mini-boss and with a few hits with a sturdy stick, it was down. It’s simple, fun and a plausible way to break up the puzzle elements with a few nifty combos with an accessible locking feature to lend a helping hand. Ary and the Secret of Seasons is a 3D platformer that takes the generic fetch quest formula and twists it into a fun and fresh game, especially with the heavy focus on environmental influence through the power of seasons. It looks great and is packed with some unique challenges that as sure to go down well among fans of the genre. The game should be landing on the eShop Q3 2019. Exordium Games is bringing their newest episode of Bear With Me to Nintendo Switch. The Lost Robots episode is a prequel to the other three Bear With Me games that are available on Steam right now but if that’s not enough, you can bundle up and get ALL of the point and click adventures for quite a steal. For £14.99, you can play through all four of noir episodic games which all have talking toys playing main roles including the witty, sarcastic and dark-humoured detective Ted E. Bear. My playthrough had me controlling a young boy who was trapped in the projection room of an old theatre. With the help of Ted E. Bear (and some hints from the developer), I tied together some old cloth, unscrewed a clunky projector and exchanged some sinister conversation with the fluffy detective. The demo was short, but I quickly got a taste for the evocative soundtrack, sharp characters and sinister mood. Bear With Me: The Lost Robots is looking to offer players an immersive universe to explore, puzzles to crack, crime scenes to analyse and all four episodes are making their way onto Nintendo Switch this summer. Narrative-driven games… They’re here in the gaming world to deliver emotion, to give a slower and more definite experience through deep and often meaningful storytelling. Enter Lost Words: an intricately crafted title that takes you through the pages of a little girl’s diary. In order to progress you’re tasked with solving puzzles that are literally written in front of you. The world of Estoria is drenched with watercolour landscapes and some immersive narration from one of the games’ designers. Each page in the diary has the story unfolding in a calm and emotive way; jumping across platforms made out of words and having different characters introduced through speech was cute and captivating. It tells the story of love, life and loss so it’s going to be a real tearjerker by the looks of things. Splitting the ‘action’ in two, as well as navigating the diary pages, there are the Estoria sections where the game flips into 2.5D and it’s altered depending on the choices you made on the previous pages. It’s an interesting concept and a surprise at first, but the change in environment to a vibrant and busy landscape contrasts well with the slower-paced diary section. Lost Words: Beyond the Page has already scooped up a tonne of awards from Best Casual Game to Best Indie game at high profile Expo’s so it’s a clear sign that Sketchbook Games are doing something right. The Devs want it on Switch but it’s yet to be officially announced. From my talks with them and the praise they shone over the handheld, makes it almost certain that it’ll appear on the digital library soon. 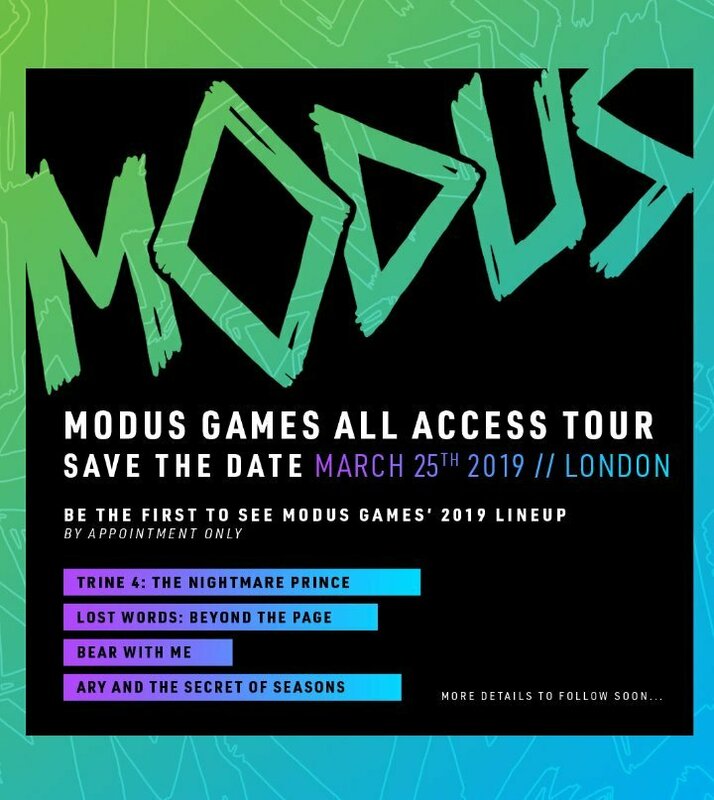 With a mouthful of a Modus branded cupcake, I left the venue quietly surprised and positive that Modus Games has a tenacious line up of indie video games coming out soon for our beloved platform. Whether it’s traversing through the unmistakably beautiful terrains of Trine 4 or bending the seasons in Ary, Switch owners should be turning their focus on Modus and the talented pool of developers under its wing in the coming months.